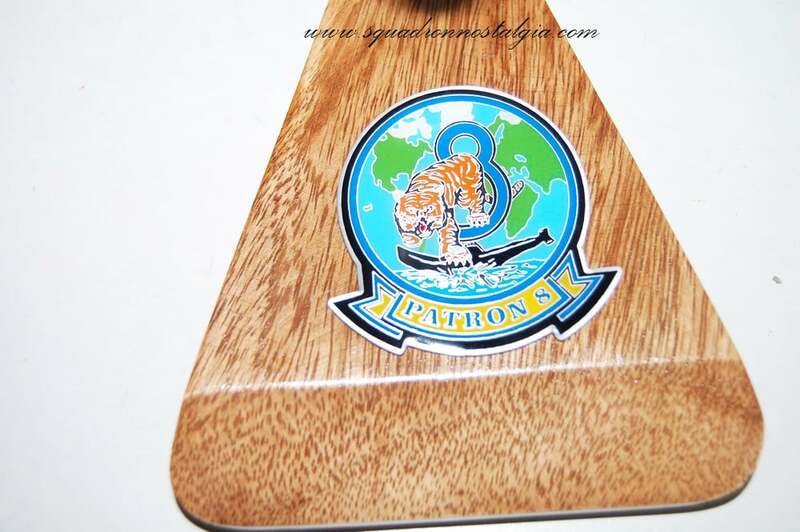 A meticulously carved 18 inch wooden P-8a of the VP-8 Tigers. 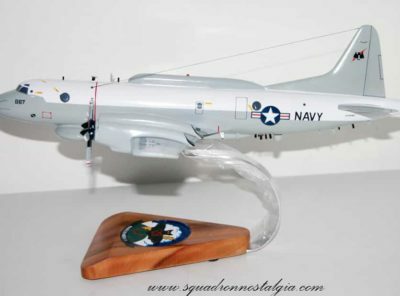 Patrol Squadron EIGHT (VP-8) was commissioned as Patrol Squadron 201 (VP-201) in September 1942 in Norfolk, Virginia. During World War II, VP-201 flew the sea-based PBM Mariner aircraft, combating German submarines that threatened Allied shipping throughout the Atlantic. 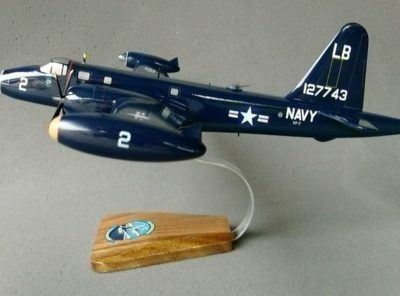 In June 1947, the squadron completed a homeport change to Quonset Point, Rhode Island and transitioned to the land-based P-2V Neptune aircraft. 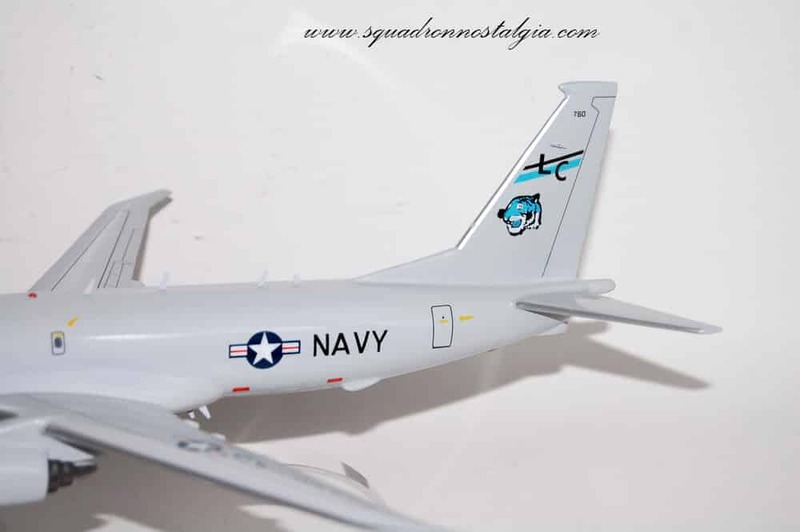 The squadron was renamed to VP-8 in September 1948, and in October 1962, VP-8 became the first operational P-3 Orion squadron in the U.S. Navy. 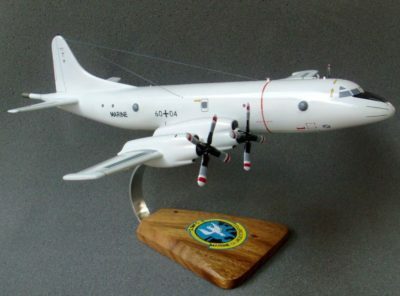 VP-8 operated the venerable P-3 above every ocean for over 50 years, earning a reputation as one of the best Maritime Patrol Aviation (MPA) squadrons. 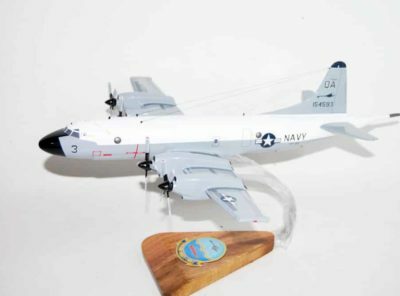 During the Cuban Missile Crisis in 1962, VP-8 demonstrated the P-3’s superior Anti-Submarine Warfare (ASW) and Anti-Surface Warfare (ASUW) capabilities by tracking Soviet submarines in the Caribbean and Eastern Atlantic. 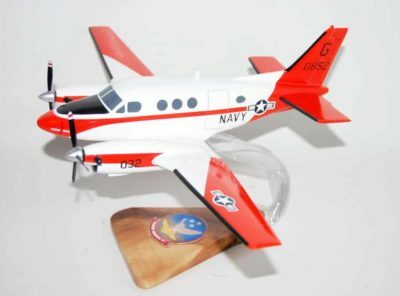 Later that decade, VP-8 flew combat missions throughout Southeast Asia in support of the Vietnam War. The squadron conducted a homeport change to Naval Air Station (NAS) Brunswick, Maine in 1971. In December 1990, VP-8 deployed to Jeddah, Saudi Arabia and Sigonella, Sicily during Operations DESERT SHIELD and DESERT STORM. 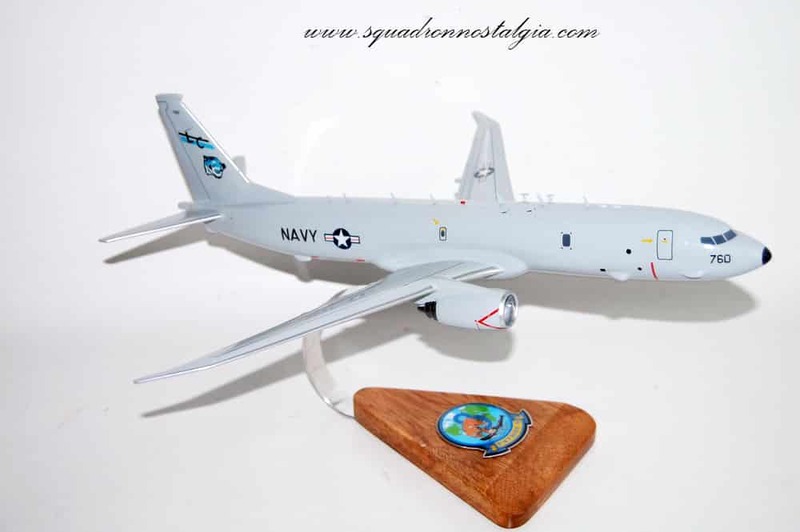 This conflict re-emphasized the P-3’s multi-mission capabilities while conducting coordinated operations with U.S. FIFTH Fleet Carrier Battle Groups, as well as monitoring Soviet, Libyan, and Iraqi naval units in the Arabian Gulf and Mediterranean Sea. Over the course of the decade, VP-8 performed brilliantly on station supporting the following operations: SHARP GUARD and DECISIVE ENDEAVOR (Mediterranean Sea), DELIBERATE GUARD (Bosnia-Herzegovina) and SILVER WAKE (Albania – supporting the humanitarian evacuation of 889 civilian personnel). 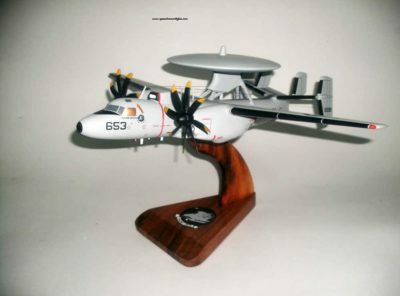 In 1999, VP-8 upgraded to the P-3C Aircraft Improvement Program (AIP) aircraft. This new warfighting suite vastly improved the aircraft capabilities which further contributed to meeting national security objectives. 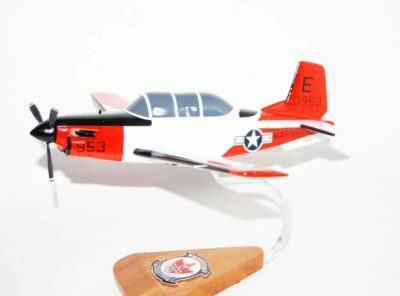 Upgrades include an improved radar sensor (APS-137), surveillance video suite (AIMS) and robust communications which allows the aircraft to transmit “near real-time” imagery and data. With this advancement in technology, VP-8 excelled at ASW, ASUW and Intelligence, Surveillance and Reconnaissance (ISR) missions in support of the following operations: JOINT GUARDIAN, DETERMINED FORGE and DELIBERATE FORGE (Bosnia-Herzegovina), ALLIED FORCE and NOBLE ANVIL (Kosovo), ENDURING FREEDOM (Afghanistan), IRAQI FREEDOM and NEW DAWN (Iraq), UNIFIED ASSISTANCE (Humanitarian Assistance/Disaster Relief missions in response to the 2004 Indian Ocean earthquake/tsunami), and ODYSSEY DAWN (Libya). VP-8 conducted a homeport change from NAS Brunswick, Maine to NAS Jacksonville, Florida in 2009. In December 2013, VP-8 embarked on its 37th and final P-3C Orion deployment prior to transitioning to the P-8A Poseidon. The dual-site deployment to Isa Air Base, Bahrain and to Comalapa, El Salvador demonstrated the squadron’s superb operational excellence as a premier MPA squadron and leader in the primary mission areas of ASW, ASUW and ISR in support of Operations ENDURING FREEDOM and IRAQI SUPPORT, as well as Counter-Transnational Organized Crime in support of Operations MARTILLO, CAPER FOCUS, and CARIBBEAN SHIELD. 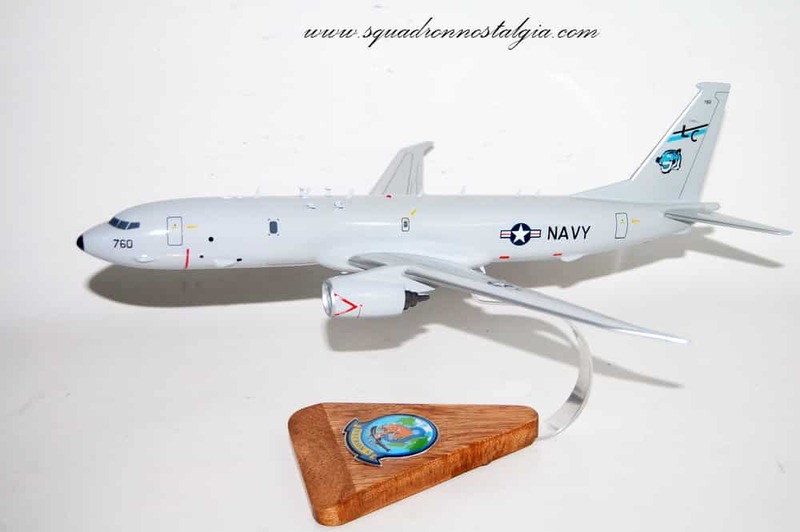 Upon completion of the squadron’s final P-3 deployment in July 2014, aircrew and maintenance personnel began a seven month transition to the P-8A Poseidon. 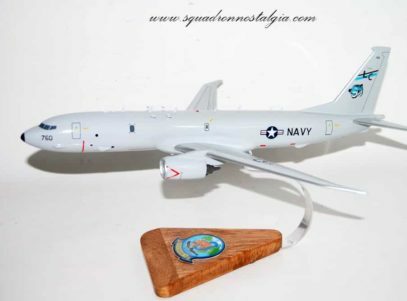 In February 2015, VP-8 will enter the Inter-Deployment Readiness Cycle in preparation for their first deployment as a P-8A squadron. 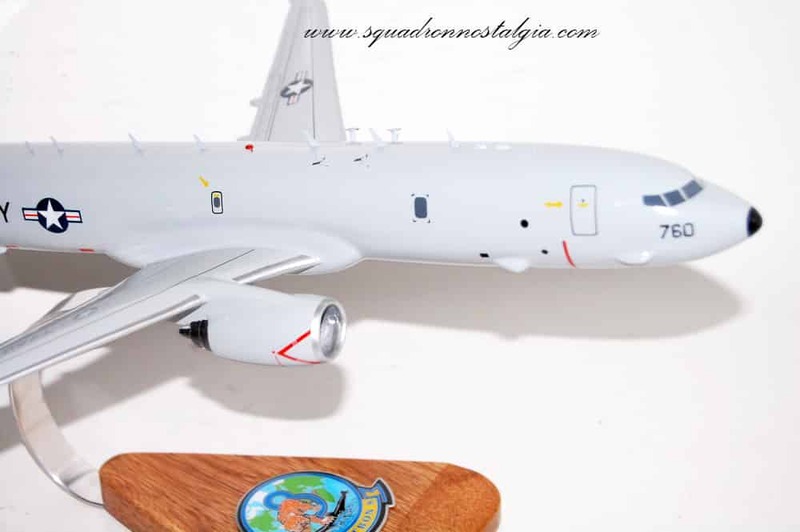 The P-8A Poseidon is a modified Boeing 737-800ERX airframe featuring a fully connected, state-of-the-art, open architecture mission system. 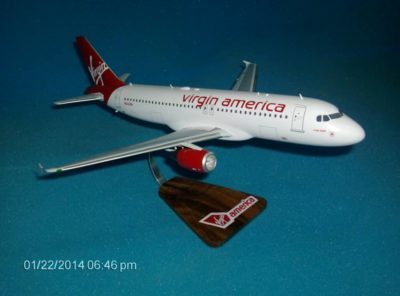 This aircraft features a highly advanced sensor suite which dramatically improves MPAs ASW, ASUW and ISR capabilities. 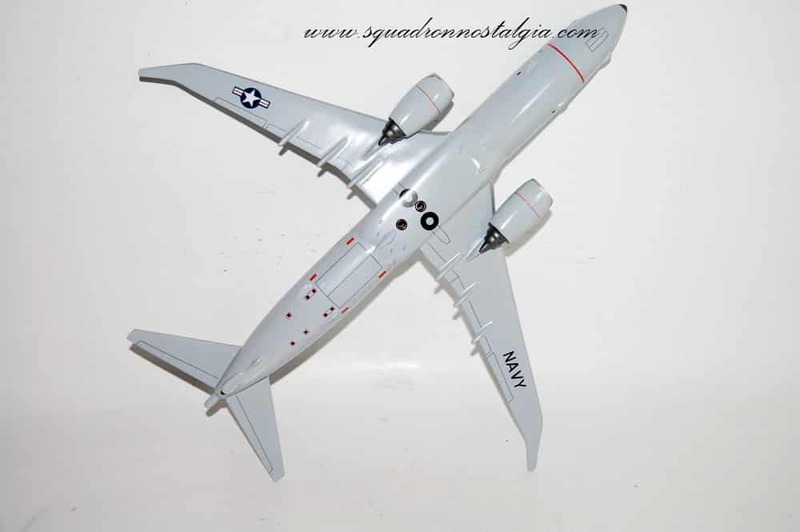 The P-8A is the Navy’s next generation fixed wing aircraft that eventually replace the aging P-3C. VP-8 has executed more than 200,000 mishap-free flying hours since 1978 and is currently led by Commanding Officer CDR Derek Adametz, Executive Officer CDR Andrew Barlow and Command Master Chief Patrick Campbell.